he Al Deira Hotel, in Gaza City, is a haven of calm in a land beset by poverty, fear, and violence. In the middle of December 2007, I sit in the hotel’s airy restaurant, its windows open to the Mediterranean, and listen to a slight, bearded man named Mazen Asad abu Dan describe the suffering he endured 11 months before at the hands of his fellow Palestinians. Abu Dan, 28, is a member of Hamas, the Iranian-backed Islamist organization that has been designated a terrorist group by the United States, but I have a good reason for taking him at his word: I’ve seen the video. Colonel Gaddafi’s regime has sent one of its most trusted envoys to London for confidential talks with British officials, the Guardian can reveal. Mohammed Ismail, a senior aide to Gaddafi’s son Saif al-Islam, visited London in recent days, British government sources familiar with the meeting have confirmed. Disclosure of Ismail’s visit comes in the immediate aftermath of the defection to Britain of Moussa Koussa, Libya‘s foreign minister and the country’s former external intelligence head, who has been Britain’s main conduit to the Gaddafi regime since the early 1990s. A team led by the British ambassador to Libya, Richard Northern, and MI6 officers, embarked on a lengthy debriefing of Koussa at a safe house after he flew into Farnborough airport on Wednesday night from Tunisia. Government sources said the questioning would take time because Koussa’s state of mind was “delicate” after he left his family in Libya. The Foreign Office declined “to provide a running commentary” on contacts with Ismail or other regime officials. But news of the meeting comes amid mounting speculation that Gaddafi’s sons, foremost among them Saif al-Islam, Saadi and Mutassim, are anxious to explore a way out of the crisis in Libya. “There has been increasing evidence recently that the sons want a way out,” said a western diplomatic source. Although he has little public profile in either Libya or internationally, Ismail is recognised by diplomats as being a key fixer and representative for Saif al-Islam. According to cables published by WikiLeaks, Ismail has represented the Libyan government in arms purchase negotiations and acted as an interlocutor on military and political issues. “The message that was delivered to him is that Gaddafi has to go and that there will be accountability for crimes committed at the international criminal court,” a Foreign Office spokesman told the Guardian , declining to elaborate on what else may have been discussed. Some aides working for Gaddafi’s sons, however, have made it clear that it may be necessary to sideline their father and explore exit strategies to prevent the country descending into anarchy. One idea that the sons have reportedly suggested – which the Guardian has been unable to corroborate – is that Gaddafi give up real power. Mutassim, presently the country’s national security adviser, would become president of an interim national unity government which would include the country’s opposition. 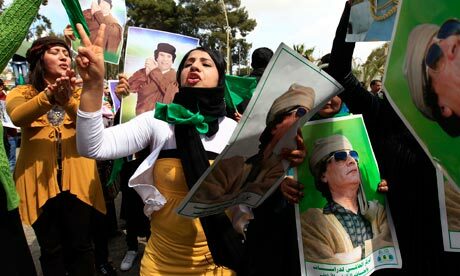 It is an idea, however, unlikely to find support among the country’s rebels or the international community who are demanding Gaddafi’s removal. The revelation that contacts between Britain and a key Gaddafi loyalist had taken place came as David Cameron hailed the defection of Koussa as a sign the regime was crumbling. “It tells a compelling story of the desperation and the fear right at the very top of the crumbling and rotten Gaddafi regime,” he said. Britain learned that Koussa wanted to defect when he made contact from Tunisia. He had made his way out of Libya in a convoy of cars after announcing that he was going on a diplomatic mission to visit the new government in Tunis. Britain took seriously reports last night that Ali al-Treki, Libya’s minister for Africa, had announced in Cairo that he too had abandoned the regime. Officials were checking reports last night that Tarek Khalid Ibrahim, the deputy head of mission in London, is also defecting. The prime minister insisted that no deal had been struck with Koussa and that he would not be offered immunity from prosecution. “Let me be clear, Moussa Koussa is not being granted immunity. There is no deal of that kind,” Cameron said. Within hours of his arrival in Britain, Scottish prosecutors asked to interview Koussa about the Lockerbie bombing. The Crown Office in Edinburgh has said it is formally asking for its prosecutors and detectives from Dumfries and Galloway police to question Koussa about the 1988 bombing. But government sources indicated that Britain does not believe that Koussa was involved in ordering the Lockerbie bombing. Koussa was at the heart of Britain’s rapprochement with Libya which started when Tripoli abandoned its support for the IRA in the early 1990s. William Hague, the foreign secretary, said he had a sense that Koussa was deeply unhappy with Gaddafi when they spoke on Friday. “One of the things I gathered between the lines in my telephone calls with him, although he of course had to read out the scripts of the regime, was that he was very distressed and dissatisfied by the situation there,” Hague said. RAMALLAH, Mar 31, 2011 (IPS) – The Israeli government has warned the U.N. Security Council and the EU that it will resort to unilateral countermeasures if the international community recognises Palestine as an independent state at the U.N. General Assembly session next September. The warning is in response to what the Israeli government perceives as attempts by critics, local and international, to “de-legitimise” the Jewish state. Over the last few months a growing number of Latin American countries have granted recognition to an independent Palestinian state. These include Brazil, Uruguay, Argentina, Bolivia, Ecuador, Chile and Guyana. Paraguay and Peru are likely to follow suit in the near future while Venezuela recognised Palestine as an independent state in the mid-2000s. Norway upgraded the Palestinian representative’s office in Oslo from a ‘general delegation’ to a ‘diplomatic delegation’. And over the past four months, several countries, including none other than the U.S. – followed by other Israeli-friendly states such as France, Spain, and Portugal – upgraded the Palestinian representations. Another one hundred or so other countries – most of them developing nations – had recognised ‘Palestine’ after Yasser Arafat unilaterally declared “independence” in 1988. Other states, mostly from the former Eastern Bloc, recognised Palestinian statehood in the wake of the 1993 Oslo peace accords. The diplomatic tide that originated in Latin America could pick up steam in Africa and Asia. A tell tale sign was when the University of Johannesburg in South Africa decided last week to cease cooperation with Israel’s Ben Gurion University and to boycott other Israeli universities. The former apartheid regime in South Africa used to be one of Israel’s closest allies. Military, political and economic cooperation between the two ostracised members of the international community was extremely close. Israel helped train South African security forces, renowned for their brutality, and helped the apartheid state with its nuclear programme – since disbanded by the post-apartheid democratic government. In return, South Africa is believed to have supplied the Israelis with uranium for their own nuclear programme. Israel’s outrage at international criticism peaked after Mahmoud Abbas, or Abu Mazen as he is better known, the president of the Palestinian Authority (PA), stated on Thursday that the Palestinians remain frozen. Last week Israel informed 15 members of the United Nations Security Council, and major EU (European Union) countries, that if the PA persisted in its efforts to gain recognition as a state within the 1967 borders, Israel would respond with a series of unilateral measures. Also last week, the Israeli foreign ministry sent a classified cable to more than 30 Israeli embassies abroad ordering them to lodge diplomatic protests at the highest possible level in response to Palestinian efforts for international recognition of statehood at the U.N. General Assembly session in September. Last September, U.S. President Barack Obama told the General Assembly that he wished to see a Palestinian state become a member of the U.N. within a year. Israel and the Palestinians also agreed that the talks they began last Sep. 2 in Washington would last for about a year. Palestinian Prime Minister Salam Fayyad stated that his efforts to establish state-building institutions would be completed by September. What exactly the Israeli government has in mind in regard to the “unilateral actions” it is threatening is not known. But these could involve the annexation of major Israeli settlement blocs illegally built in the occupied Palestinian West Bank. More bad news for Israel followed on Wednesday when U.N. Secretary General Ban Ki-moon called on Israel to halt settlement building in the West Bank and put a stop to all forms of violence and incitement. Speaking in Uruguay at the U.N. Latin American and Caribbean Meeting in support of Middle East peace Ban said it was a “crucial time” for the Israeli-Palestinian peace process. But Dr. Samir Awad from Birzeit Universitiy, near Ramallah, believes the Israelis care a lot more about establishing facts on the ground and a lot less for international opinion. “The Israelis, contrary to their claims of saying they support the creation of an independent Palestinian state, have decided, albeit off the record, that the establishment of a Palestinian state is not in their interest,” Awad told IPS. “For international consumption and to keep up appearances they will keep the charade of supporting a two-state solution up so as not to appear the peace spoilers. We’re hoping to get a 1,000,000 protestors in support with the Bahraini revolution and the Libyan revolution. We will assemble at Hyde Park corner and from there we will march to the Bahraini embassy and off to the Libyan embassy. What we demand? We want the freedom of both countries. We want the Pro Democracy civillians to have their DEMOCRACY! The Prophet (saas) used to recite the Qur’an before angel Jibreel (Gabriel) once every Ramadan, but he recited it twice (in the same order we have today) in the last Ramadan before his death. Jibreel also taught the Prophet (saas) the seven modes of recitation. Each verse received was recited by the Prophet, and its location relative to other verses and surahs was identified by him. The verses were written by scribes, selected by the Prophet, on any suitable object – the leaves of trees, pieces of wood, parchment or leather, flat stones, and shoulder blades. Scribes included Ali Ibn Abi Talib, Mu’awiyah Ibn Abi Sufyan, Ubey Ibn Ka’ab, Zayed Ibn Thabit. Some of the companions wrote the Qur’an for their own use. Several hundred companions memorized the Qur’an by heart. Umar Ibn Al-Khattab urged Abu Bakr to preserve and compile the Qur’an. This was prompted after the battle of Yamamah, where heavy casualties were suffered among the reciters who memorized the Qur’an. Abu Bakr entrusted Zayed Ibn Thabit with the task of collecting the Qur’an. Zayed had been present during the last recitation of the Qur’an by the Prophet to Angel Jibreel (Gabriel). Zayed, with the help of the companions who memorized and wrote verses of the Qur’an, accomplished the task and handed Abu Bakr the first authenticated copy of the Qur’an. The copy was kept in the residence of Hafsah, daughter of Umar and wife of the Prophet. Uthman ordered Zayed Ibn Thabit, Abdullah Ibn Al Zubayr, Saeed Ibn Al-Aas, and Abdur-Rahman Ibn Harith Ibn Hisham to make perfect copies of the authenticated copy kept with Hafsa. This was due to the rapid expansion of the Islamic state and concern about differences in recitation. Dots were put as syntactical marks by Abu Al-Aswad Al Doaly, during the time of Mu’awiya Ibn Abi Sufian (661-680 CE). The letters were marked with different dotting by Nasr Ibn Asem and Hayy ibn Ya’amor, during the time of Abd Al-Malek Ibn Marawan (685-705 CE). America’s true reason for intervention, and missile attacks against Libya has become very clear today with a sudden creation by the rebels of a new central bank on March 29th. The parallels for both European and US intervention now in Libya is very reminiscent to why the United States attacked Iraq in 2003. Six months before the US moved into Iraq to take down Saddam Hussein, the oil nation had made the move to accept Euro’s instead of dollars for oil, and this became a threat to the global dominance of the dollar as the reserve currency, and its dominion as the petrodollar. To be able to create a new central bank under the blueprint that is used by Western powers in less than two weeks by the rebels gives vast credence that the rebellion itself in Libya was initiated by outside forces, and not over demands by the citizens of Libya for social reform. This plan was put in place by the world’s game changers who want complete global control over oil and economic systems. The Israeli Air Force recently unloaded military equipment at a Saudi Arabia base, a semi-official Iranian news agency claimed Wednesday, while a large American force has massed in Azerbaijan, which is on the northwest border of Iran.Both reports follow by less than a week the Pentagon’s confirmation that an unusually large American fleet sailed through the Suez Canal Saturday. Several reports stated that an Israeli ship joined the armada.